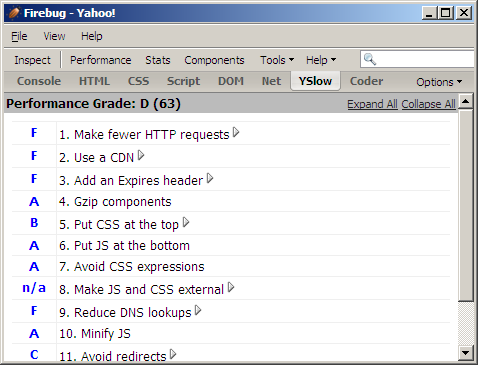 Category: Performance , Utility , Yahoo! These features make YSlow stronger at identifying performance improvements for Web 2.0 applications. It’s great that YSlow does even better performance analysis of pages, but be forewarned that your previous YSlow scores will drop if these new-found components exhibit bad performance characteristics. As mentioned in Rule 14 – Make Ajax Cacheable, some of the performance improvements that are readily applied to static content (far future Expires header, gzip compression, minification) can also be applied to Ajax responses. Whether it’s Web 1.0 or Web 2.0, YSlow 0.9 helps you figure out what to fix to make your pages faster for your users. Stoyan Stefanov goes into more detail on the new features, and you can check out the release notes. So, what does the coder tab do? It’s not in YSlow and it’s not in Firebug… Another extension? can somebody light me on one question? does it only analyzes pages using YUI library, or any page will work? such as prototype/jquery/dojo etc? It analyzes all pages regardless of library (even if it has none). This is great to hear. Just grabbed thde update! Ditto on the Coder tab question. Anyone know where it’s coming from? Can Stoyan share with us? I use it all the time when working on YSlow, it allows you to alter any property/method inside Firefox’s chrome window on the fly, without the need to restart Firefox. LiveCoder (http://stevesouders.com/livecoder/) is very cool. Joe Hewitt came to do a talk at Yahoo! and mentioned how hard it was to build Firebug because there’s no Firebug for building Firefox addons. That night I built LiveCoder (and unfortunately it hasn’t had much more attention beyond that one night). LiveCoder let’s you examine and modify the Firefox chrome (including all aspects of Firebug). So if you’re building an addon you can find bugs and test your fixes without having to rebuild and reload your addon. There’s one feature that makes it valuable for normal web pages – you can modify function definitions on-the-fly (a feature that would be nice to add to Firebug). I’ll spruce up the web page to give some intriguing examples. I use LiveCoder every day, so you might find it useful, too. …impossible to imagine life before FireBug… YSlow is useful — keep up the awesome work and many thanks, guys!